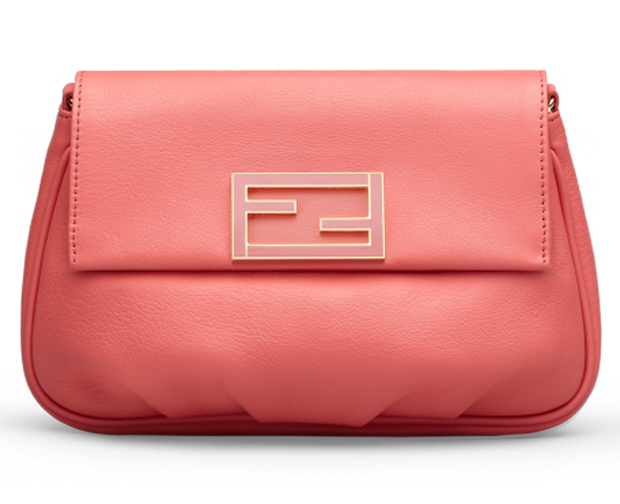 A small and cute bag by Fendi, Fendista Pouch is simply irresistible. Coming in sweet chromatic tones, this bag model appeals to your most feminine and romantic side, reminding you of the cute items created for the beloved Barbie. No matter which tone of pink you choose or if you go for yellow or even blue, with Fendi Fendista Pouch you will always be trendy and look good. No need for more accessories. Your bag will attract all the attention and the compliments, anyway. But this is something you expect when you are wearing an iconic fashion item designed by one of the best Italian houses. If you are looking for a small sized back that will accessorize your most glamorous events, Fendi Fendista Pouch can do precisely that for you. Available in pastel colors, this bag closes with a clutch that bears the houseâ€™s logo – a branding element as well as a way for you to display your excellent taste and your impeccable elegance. You can choose to wear your Fendi Fendista Pouch bag in your hands posing with it like a super model, but if you need your hands to be free, rest assured, you have the solution as it comes with a chain shoulder strap. The hardware is golden, silver or black, depending on the color version. Besides its practical role, it also comes to enhance the bagâ€™s elegant shape. Fendi Fendista Pouch is a special bag model created with delicate women in mind. The Italian fashion house wanted to give an answer and provide a solution for the womenâ€™s quest for a small and elegant bag that can yet fit inside the essential survival kit any modern woman has to carry with her: wallet, car and house keys, mobile phone, etc.